Removing internal walls will dramatically change the feel, flow and appearance of your home. Open plan living areas are incredibly on trend and popular right now as many home owners enjoy the increase in natural light and feeling of space. Removing internal walls can help you to enjoy more usable space within your home without the need for a costly and disruptive extension project. Knowing how to remove internal walls can also allow you to create a bespoke home design which is perfect for your family. 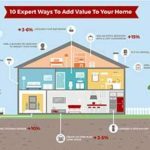 By removing certain walls, you can increase room sizes, open up living areas and create new areas in your home such as an office or play room, without having to change the footprint of your home. While knocking down a wall doesn’t sound too difficult, this should not be attempted by a well-meaning DIY-er. You should seek the advice and expertise of a professional builder if you are considering removing any internal walls. Pretty simple concept right; knock down an internal wall to open up your living area. If the wall in question is not a load-bearing wall or hiding any plumbing pipes, then the process should be as simple as the concept. Brick, stud or dry walls can be removed with ease but if you are unsure whether the wall is load-bearing or not, you should seek the advice of an experienced builder. Knocking down a load bearing wall is a much more complicated task but definitely not impossible. You will need the services of an architect or structural engineer as well as an experienced builder. They will need to determine what support will be required to take the place of the wall once it has been knocked down. They will also decide how best to sure-up and support the ceiling above while the work is taking place to protect your home and the guys doing the work. A load-bearing wall supports something above it, such as the roof, ceiling or another wall on the floor above. Load bearing walls are essential for the structural integrity of any building and removal of them must be done by a professional. Removing a load-bearing wall means you are taking away a part of the building’s support and so that support must be replaced, by a post and beam for example, to ensure that the structure of the building is not compromised. The structure of the building must also be supported during the removal process or you may risk the building collapsing. In contrast, a non-load-bearing wall doesn’t support anything above it and its removal shouldn’t cause any structural damage or changes in the building at all. Removal is relatively easy, but you should still consult a professional. One of the simplest and easiest tests you can do is to give the wall a knock or a tap; if it sounds hollow then it is likely to be a simple stud wall and removal should be simple. If you hear a dull thud, then it’s likely you’ve hit a solid brick wall and it’s a good bet that this wall is load-bearing. Another check you can do yourself is to check if there is anything directly above such as another wall on the next floor. If you are unsure, contact a builder who will come and check the wall for you. My wall is load-bearing; what now? 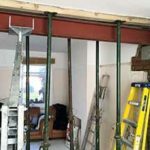 You will need to replace the support that the wall you are knocking down is giving and this is usually done using a reinforced steel beam or joist (RSJ). This beam is installed in the ceiling to support the floor or roof above. You will require a structural engineer to come in and calculate the correct load and measurements of the steel beam needed. 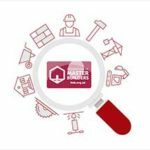 These are then passed to your building project manager who will liaise with the steel manufacturers to get your beam or joist made and delivered to your home. Once your steel work is in place, your local building inspector will need to inspect the work to ensure that it fits in with The Building and Control Regulations. If they are happy, the steel is boarded with fire protection, plastered and painting. On completion of this, the building inspector will give you a building approval certificate. It is important that you keep all your paperwork including this certificate and the engineer’s measurements. If you come to see your home in the future, you may need to produce this information upon survey. If you don’t have it, you will have to get an engineer to check what has been installed and produce their own calculations. This can be evasive and costly, and it will be you who must pay for it. Take a look at our video of work we have completed removing an internal load-bearing wall to get a better idea of exactly what the job entails. How long does the process of removing wall and remodelling the space take? Removing internal walls can take between 5 and 10 days once the work starts. 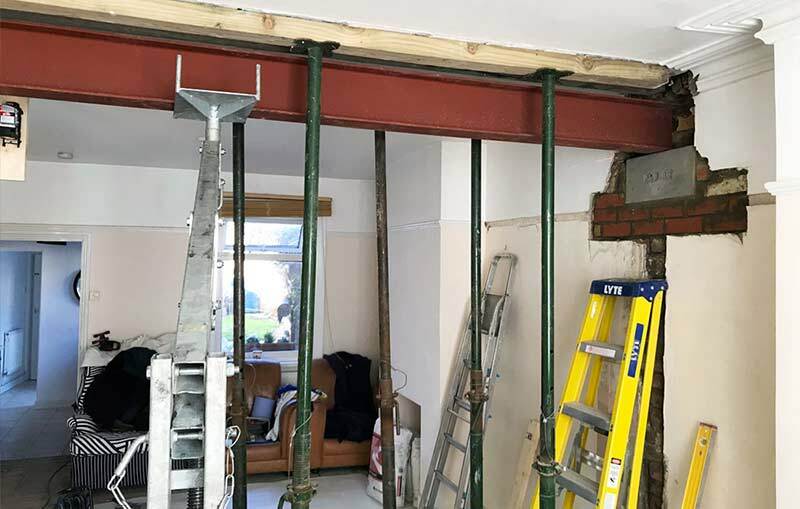 Removal of load-bearing walls usually takes the longest amount of time due to the need for additional work and the installation of the steel joist, and making good, plastering, skirting and painting etc. Making internal changes to your home do not usually require planning permission. However, engineer calculations and building notice will need to be submitted to your local Building Control Service. If you live in a listed property, you will need listed building consent for any major work, internal or external. If you are looking for a dramatic change in your home design or want to give yourself more room and an open plan look, knocking down an internal wall can give you that. But, this is not a task you should take on alone. Whilst you can undertake the project yourself, you may want to consult a professional builder for advice, especially if the wall is load-bearing. With years of experience in removing walls and remodelling interior spaces, why not give our experts a call on 020 30923791. 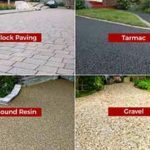 We can help create just the space you’re looking for.